English Teacher On The Loose: Organisation or Organization? Some of my students have been quizzing me on my spelling of the word organisation. Now I tend to fall back on the "It's British spelling" in answer to this in class, but in the case of organisation, z is also British spelling. So I thought this was a great opportunity to expound upon this and briefly delve into the issue of spelling in the English language over time and the differences in English between continents as well as reassure my students I am perfectly capable of spelling! Language, by its very nature, is mutable and malleable. This is what allowed such a huge array of written English over the centuries. Think Shakespeare juxtaposed with Kerouac, or Charlotte Bronte with J.K.Rowling to get even just a glimpse of the scope in classic and popular literature let alone all other types of writing out there. Then take a glimpse at how each writer has stretched and played with words to find just the right nuance of meaning. So it is with spelling. English is a mishmash of invader influence, necessity and idiosyncrasy. There are Latin words, German words, Greek words to name but a few, there are hybrids (chocoholic, aquaphobia or beatnik) and even acronyms that have become accepted as words in their own right (laser). There's rhyming slang that sounds like gibberish (old china plate or apples and pears), regional words for things that are not understood elsewhere in the same country (ginnel, gennog, jetty or alley), there are words that have reversed their meanings over the passage of time (nice or bully), not to mention street speak, text speak, and good ol' jargon. But where am I going with all this, you ask me? How does that justify the pesky, errant 's'? If you visit the Oxford dictionary on line, it may indeed appear I am mistaken in my spelling (unless you read the small print! ); here's what you get when you put organisation into Google. If you look in companions from teaching material that I use, it might also seem that I have not done my homework. Here's an entry from Burlington book's Stay Connected B2 course book for example. However, if you search a little deeper, you will see that my choice of 's' over 'z' is perfectly acceptable. According to the Oxford Living Dictionary, the s form, although not the original spelling, has been in use since the mid 1700s. 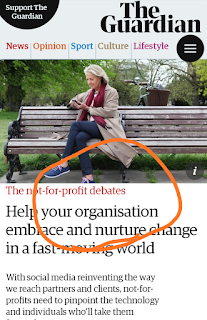 So I will continue to write organisation, and you may choose to use 'z' when you write. We are both correct. Of, course that will undoubtedly change! Should you feel the need to delve deeper into English spelling you might like these links below. Words that need to be spelled -ise.